A former child star develops an unhealthy obsession with an aspiring actress. Having watched heaps of horror films, it’s very rare to find one that unnerves me as much as Deadly Famous did. It’s a unique, interesting film with a finale so intense you will be reeling afterwards. 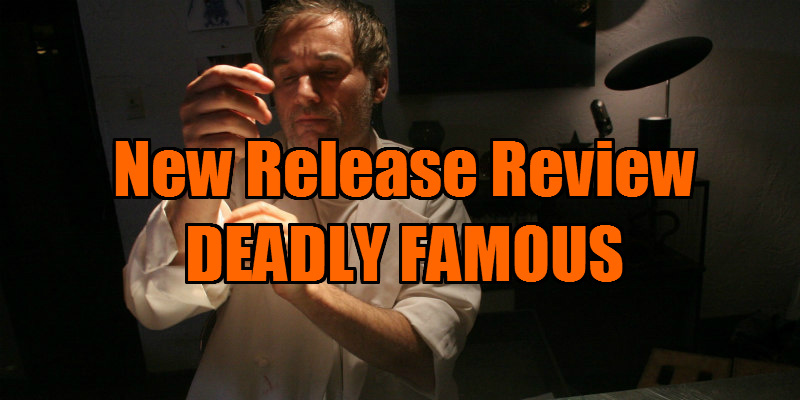 Deadly Famous is an intense character study directed by Jim Lane and Eric Troop. The film concentrates on the failed career of child actor Alan Miller (Daniel O’Meara), who lives a life of disbelief and narcissism. Alan’s ego is so large that it overshadows the reality that his career is gone downhill, he’s taking and failing auditions, coaching Hollywood wannabes and sniffing coke with Eric Roberts (played by the actual Eric Roberts). Alan gets a new housemate, aspiring actress and blonde bombshell Pamela, whom he grows a fondness for, but that fondness soon transitions into obsession and eventually Alan loses all sanity (not that he had much in the first place). The film has been compared to American Psycho by many, and I can see the similarities myself. Both films are character studies of narcissistic characters who believe nobody is better than themselves, and both characters go on adventurous killing sprees. The films also share an intense build up, not giving away the killer’s instincts straight away, giving the audience time to associate and sympathise with the characters, which I personally like because it keeps the audience keen. The plot isn’t particularly linear; it is in the way that it follows Alan’s descent into madness, but filming techniques are changed throughout. At one point there is invisible camera work (where the camera is not apparent) and other times it shifts to Alan’s personal camera, which he keeps on at all times. It’s an interesting take on the found footage genre and it’s when Alan’s camera is our view where we get to see the most brutal parts of the film. For an indie film, the gore is pretty tremendous; I found the blood to be portrayed so accurately it actually freaked me out. Alan’s murderous techniques are extremely brutal, mean and innovative. The film is one of a kind, and although it has a likeness to American Psycho it still stands on its own two feet; it’s very rare to find a horror film which is unique and so I applaud it for that. Usually, as an audience, we would have a character who we relate to and follow throughout the film, but all we have is Alan, who is so vile from start to finish it’s very hard to feel any sympathy towards him by the end of the film. I enjoyed this film, and having watched heaps of horror films it’s very rare to find one that unnerves me as much as Deadly Famous did. Faultless it is not - the secondary characters are not very well developed, but that aside it’s a unique, interesting film with a finale so intense you will be reeling afterwards.